The Circle of Life is defined as the series of stages through which a living thing passes from the beginning of its life until its death. In my ‘hood, I’ve seen it all. The drama of avian courtship and territorial squabbles. The industrious nest-building and the miracle of new life. The awkwardness of young fledglings, the sorrow of death. It’s one thing to see different birds in these various stages; it is quite another to watch a specific bird and witness its Circle of Life first hand. 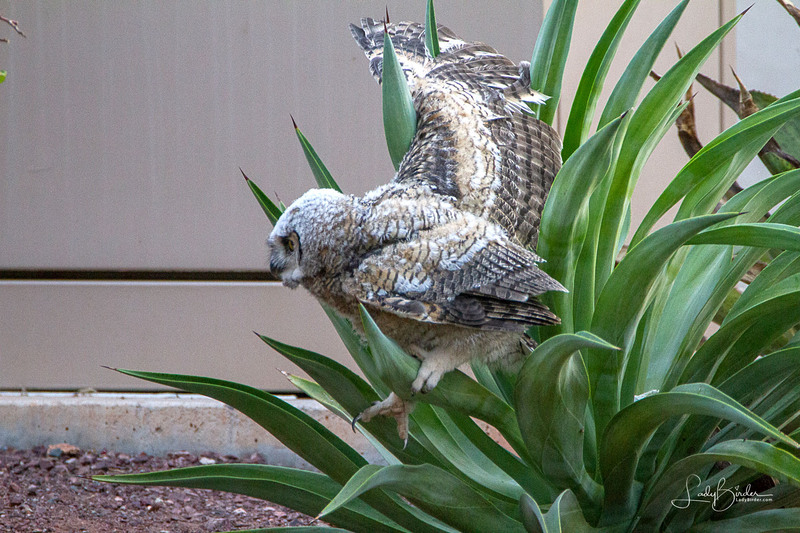 Take my resident Great Horned Owls, for instance…. 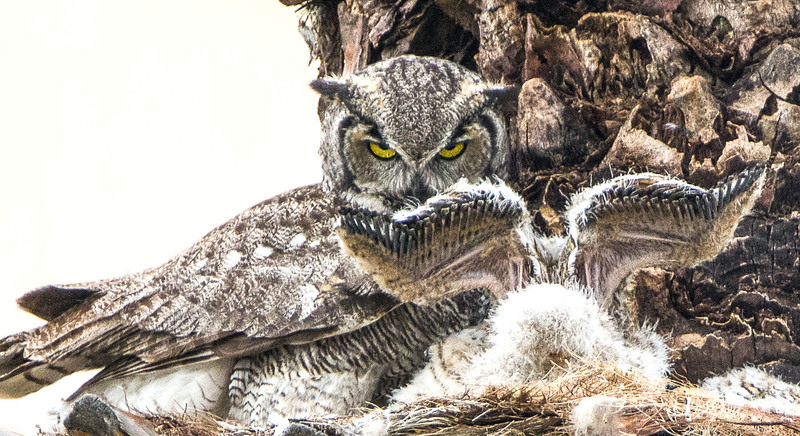 Last year I missed the mating rituals and nesting of a pair of Great Horned Owls in my neighborhood. I caught up with their two offspring at a stage of development known as “branching,” where they’ve left the nest and perch on trees while learning to fly. Each morning I’d find them in the trees near my house and they’d patiently let me photograph them with a lens large enough to keep a respectable distance, more curious than afraid. Apparently, they hadn’t learned to be afraid of humans yet. Great Horned Owls take life-long mates, but last year there was a community rumor that the male had been hit and killed by a car. This syncs with my observation of only a female attending to the two juveniles for several months until one day I noticed a male – usually smaller than a female – in the area. “Perhaps she’s found herself a new beau,” I thought. Fortunately, this year I was much more attuned to the bird happenings in my neighborhood and watched as a male and female – I would like to think it is the same pair as last year – courted and set up a rookery in a palm tree near my house. A mated pair doesn’t build a nest together, but will raise their young in the abandoned nests of other birds and often they’ll return to the same spot each year. The busy park that hosts a weekly farmer’s market with loud music and crowds of people seemed an unlikely place to bring up a family, but Mom, Dad and their brood of three didn’t seem to mind. “I’ve got my eyes on you!” First born Larry stretches his wings that are still developing (look at all those bones!) while Mom keeps her eyes on me! A female owl will lay 2 to 5 eggs over a period of days and incubate them for 26 to 35 days. Incubation of the eggs begins when the first one is laid, so there’s always a size difference in the owlets. Female owls, like many other birds, develop a sparsely feathered area on their bellies called a brood patch. The almost bare skin has a high density of blood vessels, providing a direct source of warmth to the eggs. Each day I would check on the pair – she dutifully sitting on the nest, eyes closed, and he standing guard in a nearby palm with one eye open – until one morning I noticed she was sitting higher in the nest. I was thrilled to think she was sitting on an egg or eggs and several weeks later, I spotted the first fuzzy-headed fluff ball. It wasn’t long before a second and finally a third owlet was hatched. I named them Larry, Moe and Curly for their comical appearance as they watched with bright, curious eyes the movement in the park below them. They had become stars of the neighborhood and would daily draw a small crowd of gawkers and photographers. While the eggs are being incubated they are never left alone so the male brings food to the female. But even under the watchful eyes of Mom and Dad, it is not always possible to protect them and so, as in this case, the unthinkable happened: the smallest chick was taken by a hawk. Nature’s way, I know, but still sad to witness. As days turned into weeks, the owlets’ thin coat of natal down was replaced by a heavier, second coat of down and they grew rapidly. In fact, birds of prey are the fastest growing vertebrates. Within eight or nine weeks of their birth, the babies will reach full adult weight and feathering. Larry (left, the older of the two) with Mom and sibling, Moe. One morning, the oldest owlet, Larry, was digging around the nest under Mom and his sibling until he found what he was looking for – a portion of a baby rabbit that Dad brought home the night before. Unfortunately, seconds later he lost his grip and it toppled over the side of the nest to the ground. He watched it for a while as if willing it to somehow fly back up to the nest. The next day, both owlets left the nest and I couldn’t help but wonder: was it time to move on to the next stage of development or was the action prompted by Larry’s attempt to retrieve the family’s meal? That first morning after they left the nest, I discovered Moe, the smaller of the two, in a bush by the school and he looked frightened and confused by all the activity around him – cars and buses and people all towering over him instead of his usual view from above. Suddenly, he was in the road, wobbling on unsteady feet and wings not ready to fly yet as he dodged the passing cars. I ran out and stopped the line of cars and the herded Moe to safety across the street where he teetered off like some bow-legged old man into the bushes between two houses. 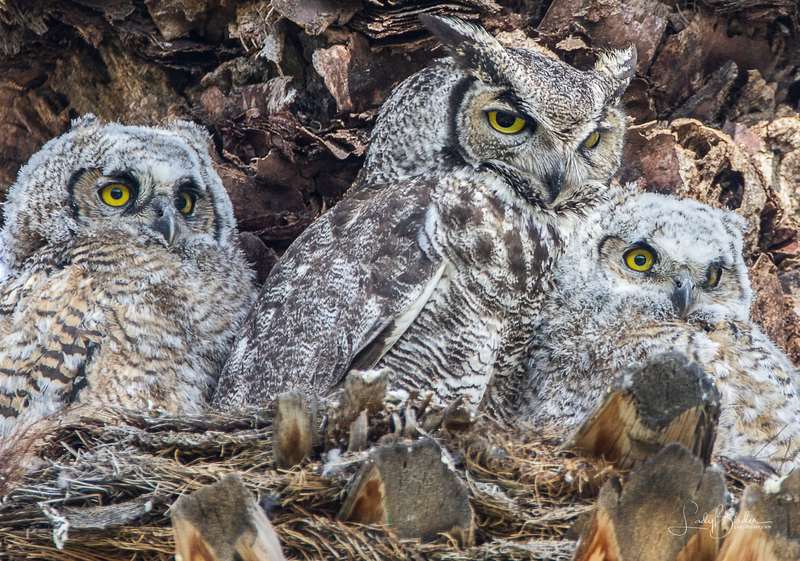 It took a day or two for Mom and Dad to gather both owlets back together and I relocated the family a few blocks away in another group of palm trees in another park. Over the next five weeks, the parents will continue to feed the young birds as they begin to make their first short flights. By fall, the owlets will have learned to hunt for themselves and will begin to disperse from their nesting area to establish territories of their own. The Great Horned Owl has a life span of at least 28 years in the wild, so hopefully, this pair will return to my neighborhood for a good many years to come! Moe, just hours out of the nest, hasn’t quite figured out how his feet and wings work. The Great Horned Owl is also referred to as a cat owl, hoot owl, big-eared owl and “the tiger of the sky” because of its aggressive nature and ability to capture prey much larger than itself, including raptors such as Ospreys, Peregrine Falcons, Prairie Falcons and other owls. They also eat much smaller items such as rodents, baby rabbits, frogs and scorpions. When clenched, a Great Horned Owl’s strong talons require a force of 28 pounds to open. Owls are considered symbols of wisdom and good luck in some cultures, but in others, they are feared as a sign of impending death and doom. Many people believe that an owl can turn its head all away around, but this is not true. Owls have fourteen neck vertebrates that allow them to move their head at 270 degrees, left to right. The color of these birds varies with the area in which they are found. Canadian and Pacific Northwest Great Horned owls are very dark, while the birds found in arid regions such as Arizona are usually very sandy in color. In the Arctic they are practically white. Your gift as the photographer is fantastic But! Your gift in pulling me into the story is truly over the top beautiful. Thank you so much. I feel honored to have such a nice compliment from a truly talented artist. Thank you, Jerry. I just read your article on the birth and cycle of life on your owls. You took me on a journey that brought tears and then heartfelt wonderful emotions. 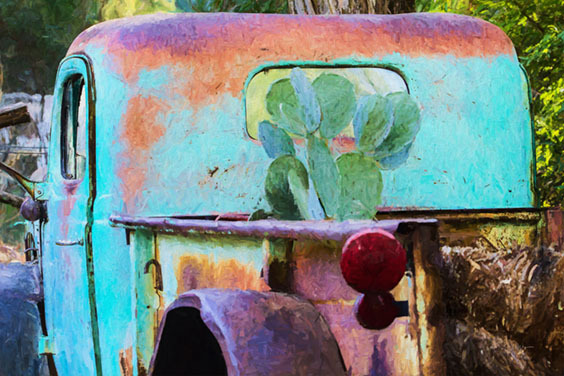 You so do deserve to be recognized on your talent as a photographer and your incredible gift of story telling. I wish for you that a nature magazine see’s your work and you become a famous author. I am proud t be your friend. Why, thank you, Gloria. That’s so very kind and left me blushing! Fascinating. Glad you were around to help the family out. I kept reading about the nest but couldn’t find it when I came by to look. Thank you, Shelley. Next time you come out to Verrado, let me know and I’ll show you around. The White-throated Magpie-Jay is still hanging around, if you’d like to see a truly beautiful bird! Great story, sad but happy. You live in such an interesting area.